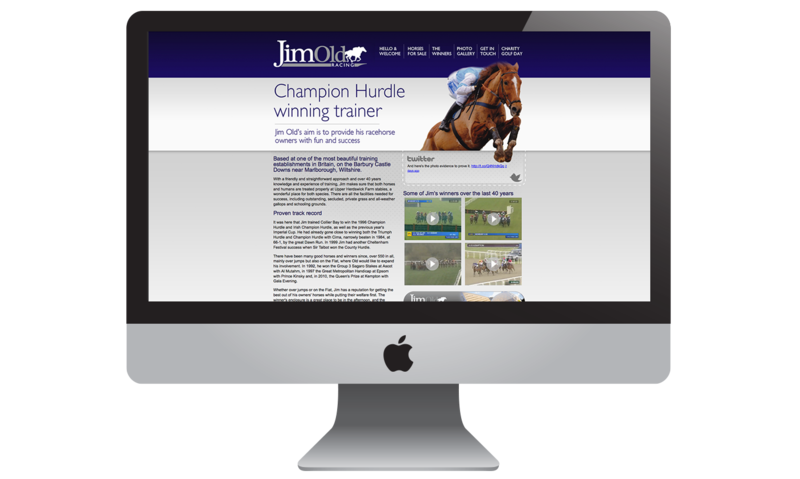 We created a new website around Jim’s the new brand (Jim Old Racing, Which we also created) to showcase Jim’s many achievements on the track over the years including his Champion Hurdle win at the Cheltenham Festival in 1996 with Collier Bay. The site also needed to include Jim’s other great past time, his golf. Jim does a lot of work raising money for the injured Jockeys Fund and holds an annual golf day at Marlborough Downs Golf Course, Jim asked that we also made this a strong part of the site. There is an abundance of information on Jim’s new site detailing a selection of his winners over the years with links through to the Racing Post website for top stats and archive info as well as video clips of some of the great races. We also had to bear SEO in mind making the site as optimised as possible, which our Google Anylitics show us we have achieved. Finally we set Jim up on Twitter and Facebook to drag him in to the 21st century and get him in touch with his fans and followers.